I specifically picked this graphic novel up because I was told that it was what the show was based off of. I thoroughly enjoy reading books in which shows or movies are based. Unfortunately you never know how closely the inspiration work will be to the source material. For me it was the other way around; I was expecting and hoping the trade would be like the show. The show captured the look, feel, and tone of the book but not much else. The biggest disappointment for me was that the comic never had anything to do with Kilgrave AKA Purple Man. The disappointments didn't end there. The story left a lot to be desired, it shows its age, and the art is definitely not pretty. The art being kind of ugly isn't necessarily a negative aspect of this book. It sets the tone, mood, and feel for the world, city, environment, and story they are telling. It perfectly portrays Jessica's life; it's rough. One thing that is sterling is the panel layout. It's absolutely brilliant. It's surprisingly colorful too. Despite the city and characters being so dark and seedy they manage to balance the darkness and the light. The color scheme never gets dull or boring due to the refreshing color palette. 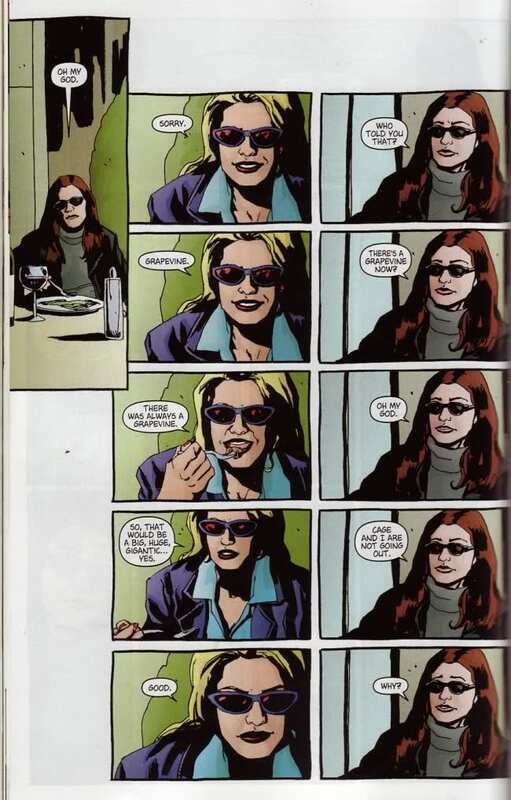 My biggest complaint is that even Jessica Jones is drawn ugly but by the end of this book that is remedied. There are few issues with the art that can be pointed out. The same cannot be said about the writing. First off, in the introduction Jeph Loeb points out that this was the first of the MAX Comics line by Marvel. Essentially all that means is that it has explicit content as the label on the front and back clearly entail. That in itself isn't a problem. The problem is that you can tell it's the first of its kind. 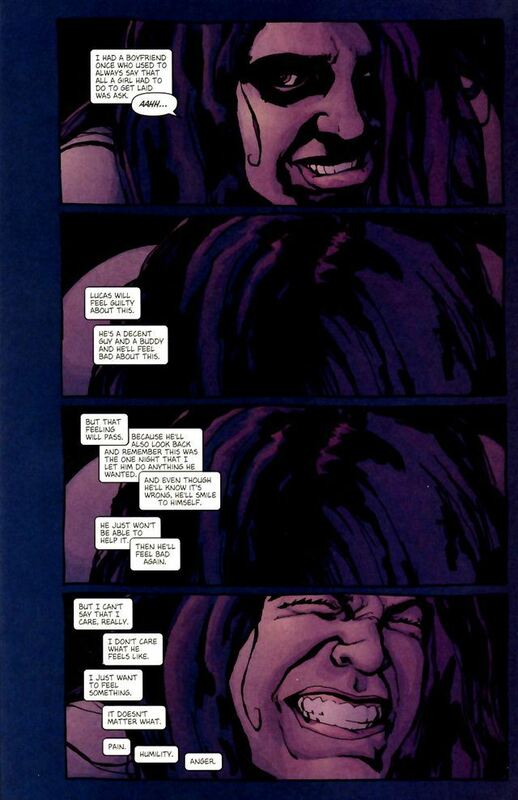 The first story is essentially about Jessica Jones keeping Captain America's identity secret. 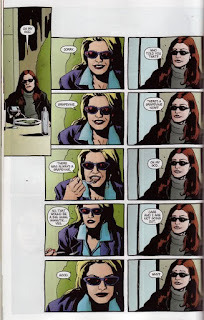 Steve Roger's identity is well known in the regular Marvel(616) universe so it seemed stupid to have such a public figure be the person Jessica refused to give up. In a day and age where we know that SEAL Team 6 killed Osama Bin Laden, it just seems ridiculous. I mean these guys were on late night and have written books about it and other missions. I know that Bendis was trying to make this MAX Comics universe more realistic and dark but he could of used any SHIELD agent and it would have been way more believable and appropriate. The second story was about a Rick Jones impersonator. It had some good moments but overall felt like a waste. This story really showed the books age by being about a character whose references are to his time being Captain America's sidekick as Bucky and the Kree-Skrull War. The book seemed like it was trying too hard to be part of the Marvel(616) universe rather than doing its own thing. 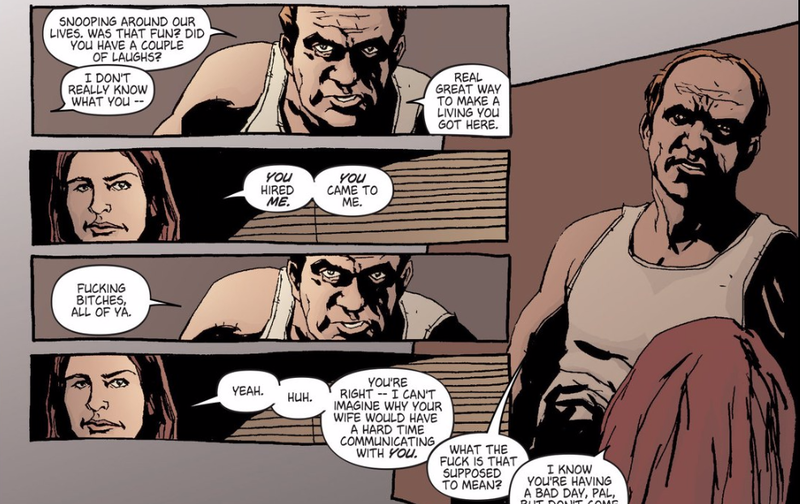 I usually love Bendis especially for his dialogue but it was so repetitive and long winded in this. It improved as it went on but once again it showed that Bendis was not the veteran writer he is today. As much as I enjoy Brian Michael Bendis as a comic book writer I cannot deny that this is not his best work. This book is wrought with issues, most of them being to the fault of the writing. The story shows the age of the graphic novel with some of its references and it feels like it tries too hard to be part of the regular Marvel comic universe instead of just doing and being its own thing. One thing the writing got right was the tone of the book. That was also due to the dark, edgy, and rough art. The color scheme was varied, fresh, and fitting. The panel structure was superb, unique, and awe inspiring. I wish I could say that the art is worth it but unfortunately it's not. Personally I regret buying this book. The look and feel of the show is the similar and overall better so just watch the show instead. If you're still inclined just borrow it from somebody, or me since I might be one of the few that picked this up. As far as my grade goes I give it STRONG Skim or borrow, maybe that should be thing now.